Part of FCC Oakdale facilities including: FCI Oakdale and FDC Oakdale, with an adjacent minimum security satellite prison camp. 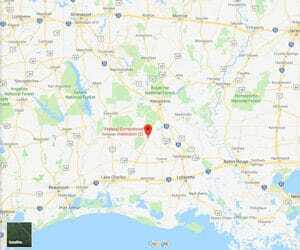 Location: FCI Oakdale is located in central Louisiana, 35 miles south of Alexandria, 58 miles north of Lake Charles, off State Highway 165 on Whatley Road. Background: FCI Oakdale is part of the Oakdale Federal Correctional Complex (FCC), which also houses FDC Oakdale, its satellite prison camp. FCI Oakdale first opened in 1986, but in 1987 the inmates rioted and burned most of it to the ground. The facility reopened in its current capacity in 1989. Notable inmates include Louisiana Congressman William J. Jefferson (sentenced for 13 years for bribery, racketeering and money laundering), and Max Butler, who stole credit card information from 2 million customers, amounting to $86 million in fraudulent charges (sentenced for 13 years for computer hacking and wire fraud). Housing: Inmates are housed in four housing units. Housing units include a dorm structure, divided between two-person and four-person pods. Health Services: Inmates at FCI Oakdale are provided necessary medical, dental, and mental health services, emergency medical and dental care, medications, periodic health examinations, and eyeglasses. Inmates new to the institution with contact lenses will be evaluated for medical necessity of contact lenses. If contact lenses are not medically indicated, the inmate will be provided with eyeglasses. Emergency care is available 24 hours a day. Inmates must submit a sick call form in order to be evaluated for routine care. Psychology Services: For inmates that require psychological care, FCI Oakdale offers screening, assessment, and treatment of mental health and drug abuse problems, individual and group counseling, psycho-educational classes, self-help and supportive services, and referral to Health Services for medical treatment of a mental illness. Several residential mental health programs designed to help inmates with severe emotional, cognitive, and behavioral problems are available for those having difficulty functioning in a mainline Institution. Inmates requiring such care can be referred for such program placement. Residential Drug Abuse Program (RDAP): FCI Oakdale does not house a Residential Drug Abuse Program (RDAP), but it does offer a Drug Abuse Education course and the Non-Residential Drug Abuse Program (NR-DAP). Education Services: FCI Oakdale provides literacy, GED and English-as-a-Second Language (ESL) programs. An incentive of $25.00 is awarded to inmates who complete a GED class by passing the Official General Education Development Examination (GED). A Certificate of Achievement is awarded for completion of levels 1 and 2 of the literacy program. An incentive of $25.00 is also awarded to inmates who complete the ESL class by passing the Comprehensive Adult Student Assessment System Examination (CASAS). A parenting program and Adult Continuing Education (ACE) classes are also offered. Self-study courses are also offered as a part of the ACE program. A high school diploma or GED is necessary for some programs. The facility also offers a sewing program. High school diplomas and post-secondary programs are available through paid correspondence programs. Advanced Occupational Education: FCI Oakdale does not offer any advanced occupational education programs. Vocational Training: FCI Oakdale does not offer any vocational training aside from its apprenticeship programs. Apprenticeship: FCI Oakdale offers apprenticeships in the areas of Building Trade and Horticulture. Library Services: FCI Oakdale offers both a law and leisure library. The law library provides legal materials via the TRULINCS Electronic Law Library. A leisure library offers inmates a variety of fiction and nonfiction books, newspapers, reference materials, and periodicals. Titles unavailable In the library may be obtained through the inter-library loan services. Library services are extended to all inmates. Commissary cards are required to check out library materials. UNICOR: The FCI Oakdale UNICOR facility produces clothing and textiles. Commissary: Inmates are allowed to shop once each week and are allowed to spend up to $360.00 per month. The shopping day is determined by the fourth and fifth digit of their BOP register number. A biometric fingerprint process is used to identify each inmate prior to commissary sales. Inmates who are fingerprint exempt must have in their possession their commissary card. A variety of items can be purchased in the commissary such as food, beverages, clothing, electronics, and more. Recreation Services: The FCI Oakdale recreation services include both indoor and outdoor activities. The gymnasium area comprises the recreation supervisor’s office and the basketball court area. The recreation yard includes a hobbycraft area. This area houses the tool room for the hobbycraft activities, an art room, and a classroom. Activities include leather craft, basket weaving, woodwork, yarn art, stick craft, free-lance painting, and drawing. Indoor activities also include dominoes, chess, card games, checkers, Yahtzee, backgammon, and Scrabble. The recreation yard has a running track, soccer and football fields, bocce ball lanes, horseshoe pits, four handball/racquetball courts, tennis/basketball court, softball field, and two volleyball courts. Court games such as handball, racquetball, tennis, horseshoes, basketball, bocce ball, and pickleball are also available. The intramural sports program includes basketball, volleyball, soccer, flag football, and softball. Organized fitness programs include run/walk clubs, fitness clubs, and a Wellness Program. Music related activities and programs are also available for inmate participation. Instruction is available in guitar and various percussion instruments.